Belmonte is in the northern province of Beiras, Portugal. It was the birthplace of one of Portugal’s greatest explorers, Pedro Alvares Cabral, who discovered Brazil in 1500, ironically by accident after being blown off course during a storm while trying to get around the Cape of Good Hope. Trading with Brazil brought great wealth to the country when a law was made that all trading with Europe must pass through Portugal first. Consequently, many rich merchants built magnificent palaces and manor houses as private residences. Cabral’s family home was the castle in Belmonte, later converted into a manor house during the 15th century. The family coat of arms can be seen above the Manueline window on one of the side walls. Cabral always took a statue of the Virgin with him on all his voyages and today this treasured statue rests in Parish Church. However, he and many of his family members were buried in the Church of Sao Tiago. Belmonte had one of the largest Jewish communities in the country. There is a Jewish Museum that tells the fascinating history of this ancient community. The old Quarter is a maze of ancient alleyways, and continues to be home for many Jewish families. To the northeast of town is a Roman tower known as Centum Cellas. It is an intriguing three story structure which modern architects to this day cannot fathom its exact function. Some believed it was a watch tower and others thought it may have been a mansion house. Beyond Belmonte is Guarda, the highest town in Portugal. It was believed to be a military base for Julius Caesar, and eventually the Moors. The Cathedral is situated in the town’s central square and was built between the 14th and 16th century. Its graceful interior has twisted pillars and arched vaults, with a white marble alter that is a Renaissance masterpiece. Also visit the Sao Vicente Church with its 16 elaborate tile panels depicting the life of Christ. Another attraction is the Town Museum located in the Bishop’s Palace with a wonderful exhibit of historical paintings and archaeological artefacts. Serra de Estrela is the highest mountain range in the country and has outstanding scenery including one of Europe’s largest u-shaped glacier gorges formed during the Ice Age. The Nature Park is very popular for hiking in the summer as well as skiing in the winter. The higher ground is used for grazing sheep and goats, and the milk they produce is made into a local cheese which has become quite famous throughout Portugal. Many of the hilltop villages go back as far as the Romans, and one that has particularly retained a medieval atmosphere is Linhares with its cobbled alleyways and granite houses. If you visit the Parish Church you will also get to see three incredible paintings by one of Portugal’s most famous paintings, Grao Vasco. Monsanto is an authentic ancient Portuguese village perched on the side of a mountain and has not changed for hundreds of years. It was voted the most popular village in Portugal, and as a consequence it has been allowed to remain a living museum. The houses were built between gigantic boulders which is quite stunning to see, and there are spectacular views from the castle stretching as far as the Serra de Estrela. 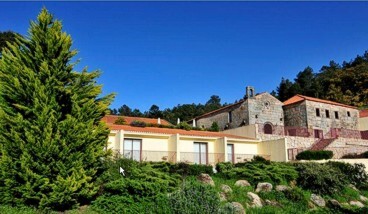 Southwest of Serra de Estrela is Piodao, one of the most picturesque villages in the area. Once very remote, its schist houses have made it quite a tourist attraction. Although it is not easy getting to many of these places by public transport, the drive is spectacular and coming back to Belmonte at the end of the day is all the more special should you choose to stay at the Pousada de Belmonte (Hotel Convento de Belmonte). It is a wonderful combination of historical architecture combined with modern elegance and is located half a mile away on the slopes of the Serra de Esperance. The views alone make it very special. There is also a seasonal pool and an exceptional restaurant that serves both local and regional cuisine. Nearby are several activities you can take part in such as fishing, hiking and horseback riding, all of which can be arranged from the Pousada.